Now that I have my own kiddos, who are fruit monsters, I like to keep fruit cups on hand for a quick snack. I try to always have fresh fruit on hand, but we will inevitably run out at some point - and then it's Mom to the rescue! They are also perfect for road trips, or just to have in our "to-go" bag in case one (or both) of our fruit monsters need a little something to hold them over until their next meal. 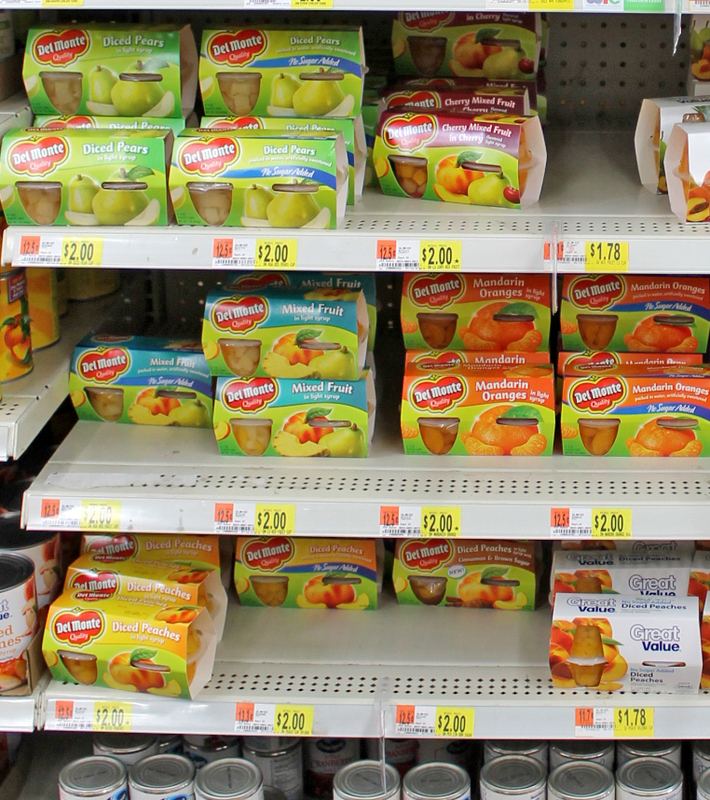 With school back in session, I know parents everywhere are stocking up on fruit cups to put in their kiddos lunches. My kiddos are not in school, but I was still inspired to make something out of a childhood favorite, even if the packaging has changed. 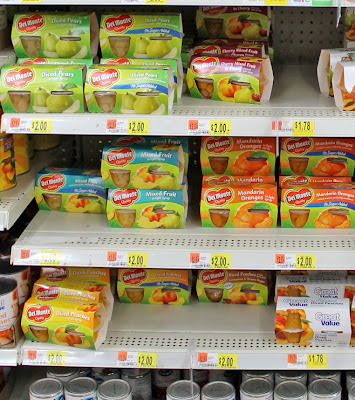 We headed to Walmart to check out the selection of fruit cups, check out our shopping trip on Google+, and were pleased with what we found. No Sugar Added varieties for each selection offered. LOVE IT!! I gathered up my non-baking supplies - I love that this takes no baking! 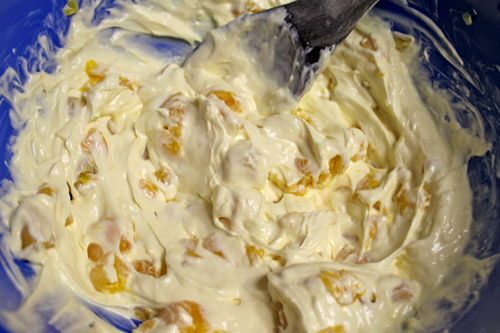 Sugar, Graham Crackers, Butter, Cheesecake Filling, Whip Cream and of course the Del Monte Diced Peaches - No Sugar Added. 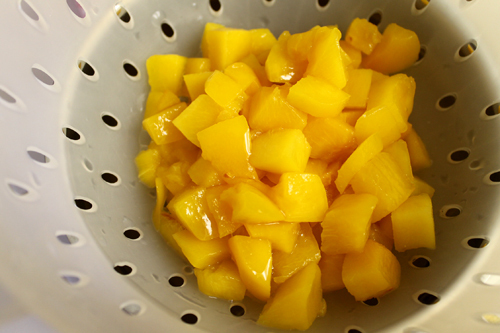 First step is to drain all 4 cups of Diced Peaches, but do not throw those little cups away! 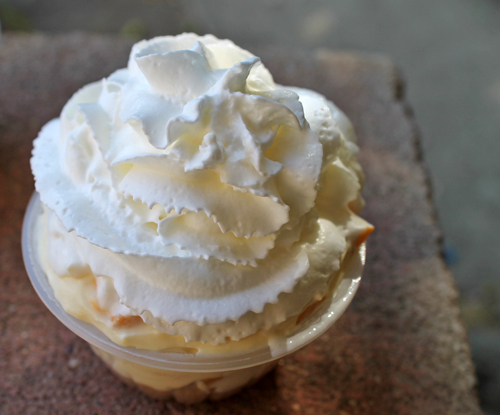 Back to those little cups that the peaches came in. Rinse and dry them out, keep them on standby. 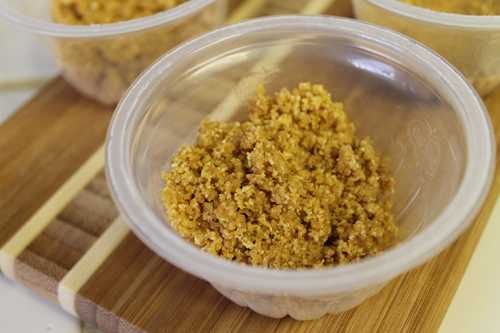 Mix the two with a little bit of sugar and the crust is ready! 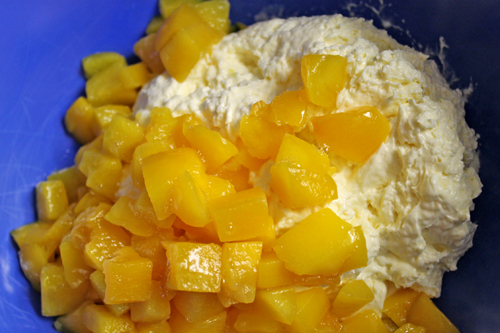 Spoon the crust mixture into fruit cups, dividing it evenly. 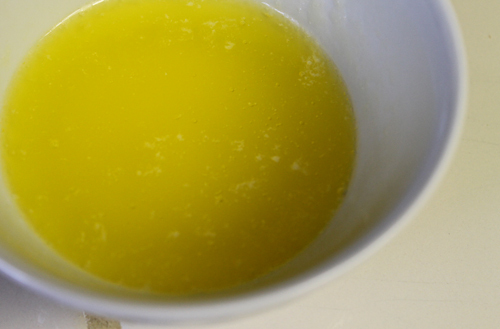 Using your fingertips, lightly press down crust into bottom of cups. 1. Drain peaches. Do not throw away plastic cups. 2. 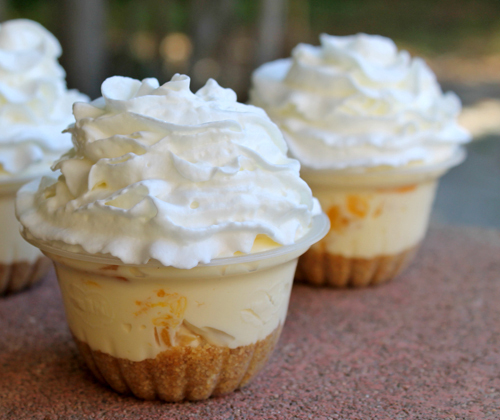 Mix peaches with cheesecake filling, set aside. 3. Wash & dry plastic cups, set aside. 4. 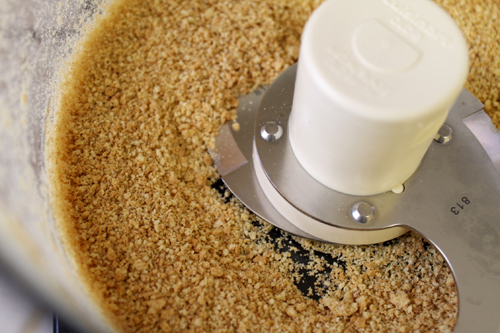 Mix crushed graham crackers, melted butter and sugar together. 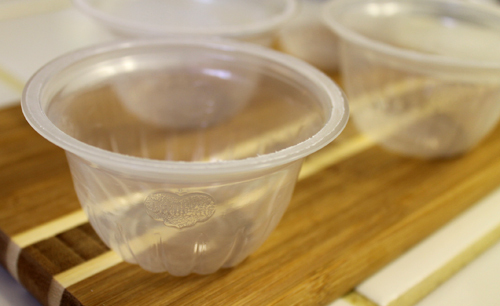 Divide evenly over 4 plastic cups. 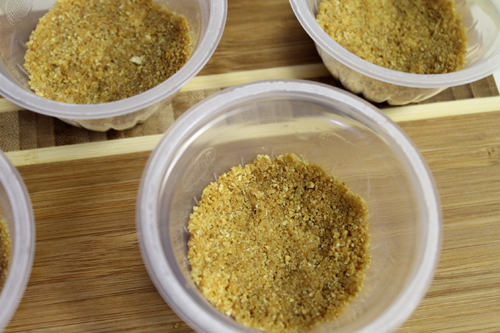 Using fingertips, lightly pack into bottom of cups. 5. Spoon cheesecake mixture on top of crusts, dividing evenly. Let chill for about 30 minutes, or until cheesecake has had a chance to set back up a bit. 6. Spray whip cream on top and enjoy!! For more information on Del Monte, you can check out their website, http://www.delmonte.com/, like them on Facebook, http://www.facebook.com/delmonte, or follow them on Twitter, https://twitter.com/DelMonteFoods. 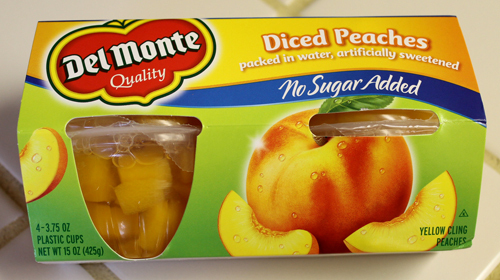 Or if you are looking for more delicious recipes to use your Del Monte fruit cups with, check out Del-Monte Smart Snacks, http://www.delmontefruitcups.com/. OK, that looks yummy! And I LOVE how you reused the cups! Genius! Wow that looks delicious! I need to try this. Yum- and great way to reuse the cups. Oh wow!! Those look amazing!! What a great idea! Made this yummy treat for a work food day! 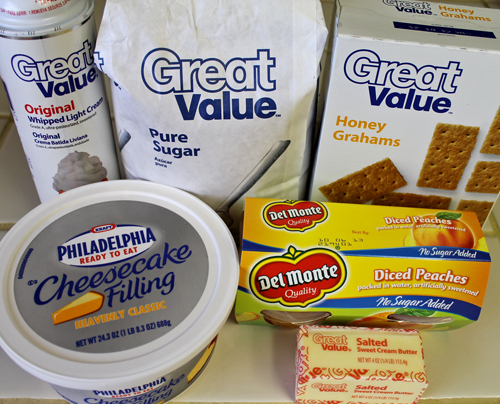 Could not find the Philly cream cheese filling so I went with the cheese cake kit mix. 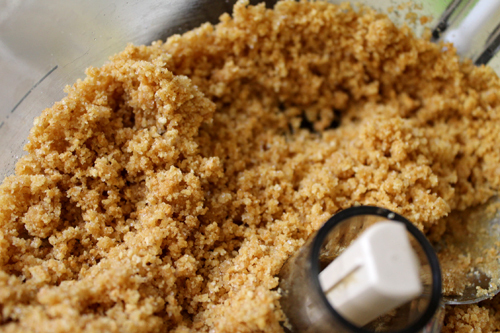 Already had the graham crust and made the filling. 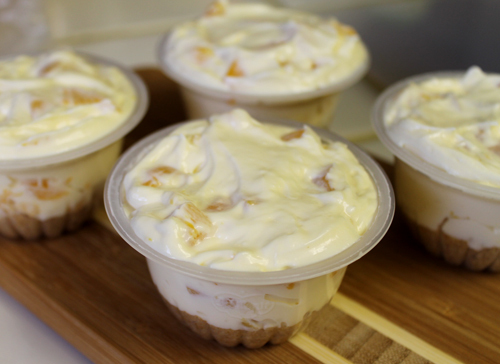 I liked the mandarin orange over the peaches, personally but all in all a fun treat to make and I'm looking forward to sharing this tomorrow! That is a great recipe and idea for recycling those cups. Going to try this tonight.